For most homeowners, a sewage ejector pump is not something you ever think about – until it’s not working that is. A non-functioning sewage ejector pump can cause major backups in your home and, if not dealt with immediately, considerable property damage. What is a Sewage Ejector Pump? Sewage ejector pumps are typically installed in homes where a bathroom, laundry room or kitchen are located in the basement. Typically your home’s plumbing system will use gravity to ensure water and waste is properly removed. However, when homes have finished basements a sewage ejector pump is required to pump waste up and out of the home to the sewer line or septic tank. What causes a Sewage Ejector Pump to fail? Sewage ejector pumps most often fail if they are improperly sized or installed, due to age and normal wear and tear, or if they are not properly maintained. Flushing items like disposable wipes, feminine products, and other damaging materials down the drain can put unnecessary stress on the pump and cause it to fail prematurely. 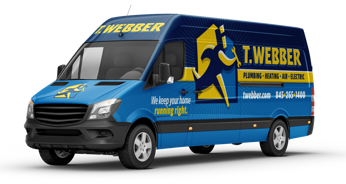 If you are experiencing an issue with your sewage ejector pump or considering installing a new sewage ejector pump to protect a basement renovation, call the Sewage Pump Experts at T.Webber. Our team of Plumbing & Drain experts have the knowledge and experience to solve your sewage ejector pump problem promptly and professionally. We provide same day sewage ejector pump service and installation throughout the Hudson Valley, including: Dutchess, Putnam, Westchester, Orange, Ulster & Rockland County.